It’s been five years since the end of the Mass Effect trilogy, so to say expectations were high for Mass Effect: Andromeda is an understatement. On release, the internet got bent out of shape over some dodgy animation and whilst it was dodgy, it wasn’t the train wreck people had implied. That said, Andromeda just about meets expectations without exceeding them. It’s a fair Mass Effect game, as opposed to a great one. This time around we’re 600 years in the future and a whole galaxy away from the events of ‘the trilogy’. Our hero is Ryder, the human pathfinder whose job it is to find a home for the people who have travelled all this way. The game starts with Ryder coming out of stasis only to quickly realise that the other arks, scheduled to reach the rendez-vous point called the Nexus haven’t made it. Each ark had its own pathfinder, ensuring all the races were represented, but an unforeseen turn of events means Ryder is the only one and humanity is the hero once more. Right from the start, the influence of No Man’s Sky is clear. The first planet we land on has a hostile atmosphere, so you can’t stray too far from your vehicle without radiation levels going through the roof. Alien critters shoot poison at you or nip at your ankles and it’s all about exploration and logging plants, minerals and fauna. The planet is uninhabited, but there are massive ruins from an ancient civilisation called the Remnant, which hold the key to success. Scattered across key planets in the galaxy are Remnant monoliths, which if activated open underground areas called vaults. The vaults serve as dungeon crawls and completing them allows Ryder to tap into Remnant technology, which can alter the atmosphere of the planet, making it more habitable. Once a planet’s climate is stabilised, Ryder can create an outpost and start waking people up from stasis to help establish communities on the planet surfaces. This is the central mission of Mass Effect: Andromeda, but of course it’s more complicated than that. Enter the Kett – the antagonists of Andromeda. On first contact, the Kett definitely shoot first and appear to be extremely hostile. There’s a moment where we try to make peace, but then they’re just an excuse for a good gun fight. The other main enemies are the sentinel style robots guarding the Remnant vaults, as well as the planet side critters. Much of Mass Effect: Andromeda will feel familiar to anyone who has played the first games and that’s no bad thing. The game has the same structure of fly around in space, scan planets (yes, unfortunately, it’s still boring and still there, but I can’t seem to pass a planet without scanning – help me), select a planet, go down, complete missions, meet NPCs, return to ship. On-board your ship you’ll quickly fall into the pattern of wandering around and talking to all of your crew to advance romances or just see what’s going on and collect missions or story information. That’s what we want from a Mass Effect game and that’s what’s delivered. In terms of the new, the UI takes some getting used to. The map is two button clicks away, which is annoying, instead of being mapped to ‘options’ (on a PS4). Inexplicably you get into a vehicle with triangle, but if you press that, hoping to get out again, instead you’ll be pinged off planet and back to your ship with a flying cut scene. 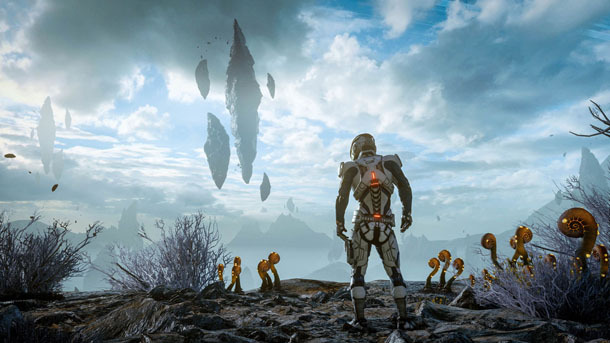 In addition, the missions are hidden in a menu within a menu and Mass Effect: Andromeda has a lot of missions, to the point that it may become overwhelming. Just the other evening, one mission timed out and I was notified that I’d failed it because I hadn’t turned up for three weeks. The other thing is you can only see one mission at time on your HUD. This means to select a different one, you click into options, then missions, then you have to trawl through the sub-categories, such as ‘relationship quest’, ‘additional’, which is just another lesson in frustration. There’s new crafting system, which is also hard to navigate. You are required to research items to craft and then develop them separately, which just adds an extra bit of chore to the whole process. Half the time I’m tempted to just buy the thing I’m trying to craft and save time. Also it’s difficult to compare what you’ve got with what you’re about to spend resources to make. In short, the UI is not intuitive at all. It’s cumbersome and actually gets in the way, especially when it comes to loading different skills and powers in the middle of combat. The whole thing creates an awkward settling in period in the first hours of the game, which doesn’t go away, you just get used to it. The combat in Andromeda has been improved with an intuitive cover system. Ryder also has a jet pack and a dash button, which allows for aerial combat and attacks. One thing I miss is being able to command my squad mates in combat. This time around, the whole thing has been stripped back so that your team looks after themselves. Other than levelling them up, you can’t decide which weapons they use or issue anything other than ‘stay’ or ‘go’ style commands on the battlefield, which is a shame. The biggest change to combat is that Ryder is not tied in to one build. You can start as an adept and then change to a soldier or engineer style fighter, depending on what you’re facing. This creates a mix and match style that means your path isn’t determined at character creation. In character creation, the surprise addition is the option to design your sibling twin, who then becomes part of the story later in the game. It’s an interesting addition, which adds extra depth to Ryder’s story. The game also designs your father to look like the Ryder you’ve created, which is really cool, but does mean the customisation is limited to just a few face shapes, meaning you’ll probably run into your doppelganger along the way. When it comes to relationships, Andromeda’s a bit of a mixed bag. The dialogue options are better, as rather than the renegade/paragon choices of the earlier Mass Effect games you have more grey areas to choose from. You can be pragmatic and logical or sometimes choose to be emotional or flippant. In addition, the romance story arc is less rigid. There are times when I think I’ve crashed and burned with one potential love interest, but then it turns around in another conversation. This makes them feel like more fully realised characters who sometimes have off days or just don’t feel like talking. You can also choose when to take the relationship forward, opting for a friendly gesture, such as a hug, rather than the full ‘let’s get it on’ if it feels too soon. Despite the more flexible dialogue and interaction system, the romance options are a bit disappointing. The team are a bit bland, to be honest with Peebee, the asari, being the strongest character from your first meeting. There’s the gruff replacement for Wrex, called Drak and a few humans to choose from, as well as the new alien, Jaal, who is probably turning heads and is one of the star turns in Andromeda. Some of the conversations with Ryder feel like a job interview – “So why did you come to Andromeda?” while others feel natural. The crew have lives they’ve left behind and goals and regrets, without feeling like hollow archetypes. Vetra worries about her sister, while Liam wants to build morale with a film night and Cora is struggling after Ryder is promoted to Pathfinder over her. It sounds like I’m not enjoying Mass Effect: Andromeda, but that’s not true at all. Despite its flaws, it’s a thoroughly enjoyable space opera that’s difficult to put down. Each planet is chock full of side quests, but you can focus on the main mission and return to mop up all the extras later. The main story is good and the characters are well drawn, despite some clunky dialogue. There’s lots to love here, with improvements that show promise for future games. However, there are just too many clumsy elements to put it on par with the original trilogy. The post Mass Effect Andromeda Review – No Man’s Sky with Relationships appeared first on Game Industry News.